You know how little girls imagine themselves princesses twirling at the ball? Well, I tried to imagine that but after tripping over a hoe somehow knew that my family sure as hell wasn’t royalty. It felt really special to be about 6 years old and discover I was from a long line of serfs! Hey, quit smirking – a lot of us first generation folks come from families who – well – didn’t have the proverbial ‘Pot’. Salvatore Guerrera, the patriarch of my family, was a contadino, farmer. Now, don’t think of the agri-businessman of today or even the great local organic farmer. In the Pontelandolfo church and commune records my family members are all listed as “contadino and/or bracciante” They were peasant farmers who “gave their arms work” for another person. Serfs – now that is a word we all know. Or sharecroppers – these men and women worked the land for a piece of the garden pie – a very small piece. Over a period of 18 years, I have shared many a long and wonderful Pontelandolfesi meal with my extended Italian family. When the coffee was served, I often steered the conversation to stories about my bisnonno. The elders, his grandchildren, vaguely remembered him but really remembered the stories about him that their parents told. What was he like? Where did he live? What did he do? These alert and fun filled men and women regaled me with tales – all in the dialect of the town. I didn’t have a clue as to what they said. They knew I didn’t have a clue, but kept right on talking. Today, having taken years of Italian, I still only understand about 20% of what anyone says in dialect. Not to lose the stories, I shot lots of video tape. Much of it still needs to be translated. The ever gracious linguist, Annarita Mancini, helped by giving me some short summaries. The central theme was that my incredibly well built bisnonno was a Robin Hood kind of guy. If the landowners weren’t sharing, he would not so subtly help the process along. One tale, set after World War I, told of great deprivation – everything of any value was used for the war or stolen by the enemy. There wasn’t a bit of food to eat or even wood to burn for heat. Salvatore Guerrera approached the landowner and asked if he could cut down a really big tree – one of the last trees. The man said, absolutely not, I’m saving that tree for myself. Salvatore looked at this incredibly tall tree and thought 50% is good enough for that uncaring @#$%$#. “Noi braccianti have provided him with much much more.” He then climbed up to the middle of the tree and began to saw. Soon the top of the tree tumbled to the ground, was chopped up and shared. No one remembers what the landowner did – but they kept remarking that their nonno was really big and really strong. Hmmmmm. Three walls are left of my great grandfather’s house. 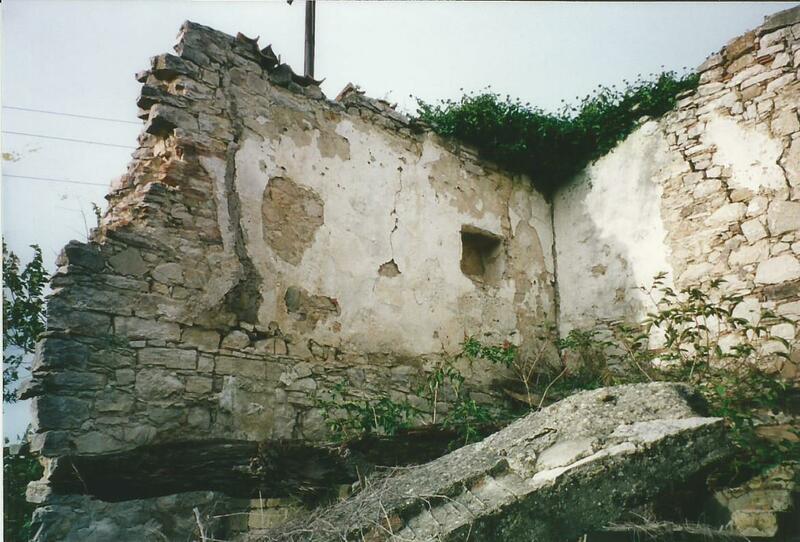 We were led to what is left of Salvatore Guerrera’s house by his grandchildren. I could write about it but, frankly, am enjoying editing video. What follows was shot in August 1995 – the first time I saw the house with my Zia Caterina – and June 2002 when we brought my father there. Next postLand Line Phone? NO! VOIP? YES! It’s great to see Aunt Catherine and your dad again. I’m so impressed with your growing technical skills. Your ancestor had money for sure ! a stone house says a lot about the economics of the times. thanks for sharing. Everyone has a stone house – the stones are all over the mountain and used for everything. I am so proud of your adventures. Next year I hope to be included in some of them! I just watched the video of Aunt Cat and cute little Guisy!!! Even then she was a photographer!